At Vision Dental, our Menai family dentist provides comprehensive care to patients of all ages. 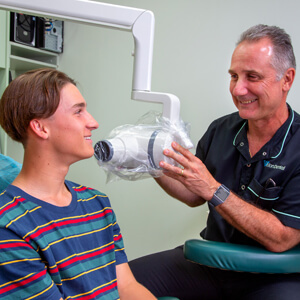 We offer a wide range of affordable general dentistry services to suit all your needs, and Dentist Dr Stephen Suster especially enjoys offering children’s dentistry, cosmetic dentistry and orthodontics. Preventative Dentistry – Enjoy gentle cleanings and preventative care to keep problems like gum disease, tooth decay and TMJ problems at bay. Smile Enhancement – Looking for a smile makeover? Dr Suster provides everything from cosmetic teeth whitening and braces to porcelain veneers. Plus, you can even preview your new smile on a diagnostic model prior to having your permanent treatment completed. Restorative Dentistry – Options like dental implants, crowns, bridges, root canal therapy, and wisdom teeth removal can help you enjoy a full, healthy smile, no matter the condition of your mouth. Sleep (Sedation) Dentistry – Feel nervous about going to the dentist? It’s ok; we can help. Enjoy comfortable sleep dentistry right here in our Menai clinic. No referrals necessary. Children’s Dental Care – Helping your child enjoy their trips to the dentist ensures a more positive outlook on dental care in the future. Dr Suster is extremely patient and attentive to the needs of our young patients and their families. Sleep Apnoea Options – Do you struggle with sleep apnoea or chronic snoring? Find out about our convenient oral sleep apnoea appliance to get results as quickly as the first night of use. TMJ Therapy – If you struggle with TMJ disorder, we provide a variety of options to help you eliminate pain, headaches and muscle aches. Our in-house HICAPS machine allows you to file claims (including Medicaid and Child Dental Benefits Scheme) on the spot. We offer 0% interest free financing and payment plans. Schedule your free initial consultation today!